Police shoot protesters in Armenia on March 1, 2008. Eight people were killed in clashes in Armenia’s capital Yerevan on Saturday between police and protesters alleging election fraud, police say. 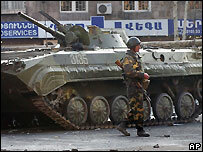 The government has declared a state of emergency and troops and armored cars are patrolling the center of Yerevan. 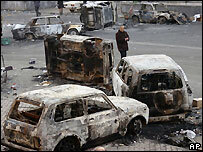 TV pictures showed burnt-out cars and smashed shop windows in the city. There have been 11 days of protests over the 19 February presidential vote which gave a convincing win to Prime Minister Serzh Sarkisian. Outgoing President Robert Kocharian declared the state of emergency late on Saturday after police used tear gas and fired shots in the air to break up a crowd of thousands of opposition demonstrators. A police spokesman said that eight people were killed and 33 police officers injured in the clashes. He said several officers had been injured by gunfire. By Sunday morning, calm had returned to Yerevan, with the city center under tight security. Opposition presidential candidate Levon Ter-Petrosian has said he was under house arrest but recorded an appeal for his supporters to leave the streets. The government has said Mr Ter-Petrosian is not being prevented from leaving his home. The state of emergency declared by outgoing President Robert Kocharian bans public gatherings and imposes restrictions on media reports and is to remain in force until 20 March. As he announced the emergency state, he appealed “to the people of Armenia to show restraint and understanding”. Official results gave Mr Sarkisian 53% of the vote, with Mr Ter-Petrosian, a former president, getting 21.5%. International observers judged the election in the ex-Soviet Caucasus republic to be generally democratic. But the opposition says the poll was rigged in favor of Mr Sarkisian, a close ally of Mr Kocharian, who is barred constitutionally from seeking a third term in office. Correspondents say the unrest has risked destabilizing a key Russian ally which lies between the energy-rich Caspian Sea and the markets of Europe. The clashes broke out after security forces cleared an opposition protest camp from a city center square on Saturday morning. Protesters reassembled nearby and later in the day there were pitched battles between security forces and protesters. Demonstrators hurled stones and petrol bombs, setting vehicles on fire, and police and troops responded with truncheons, tear gas and by firing bullets in the air.